To celebrate Dover Street Market’s latest revamp, the biannual Tachiagari, Rei Kawakubo’s fashion store held a housewarming with tea and cake for the designers, who mingled in the redesigned space with each other and unsuspecting customers on Wednesday afternoon. New sets by Kawakubo, Stephen Jones and Andy Hillman amongst others once again provide a rich retail experience. In addition to installing Perspex cabinets to house her full collection, Simone Rocha has filled DSM’s window display with the backdrop to her catwalk show – a makeshift green wall inspired by Ireland’s wild outdoors. 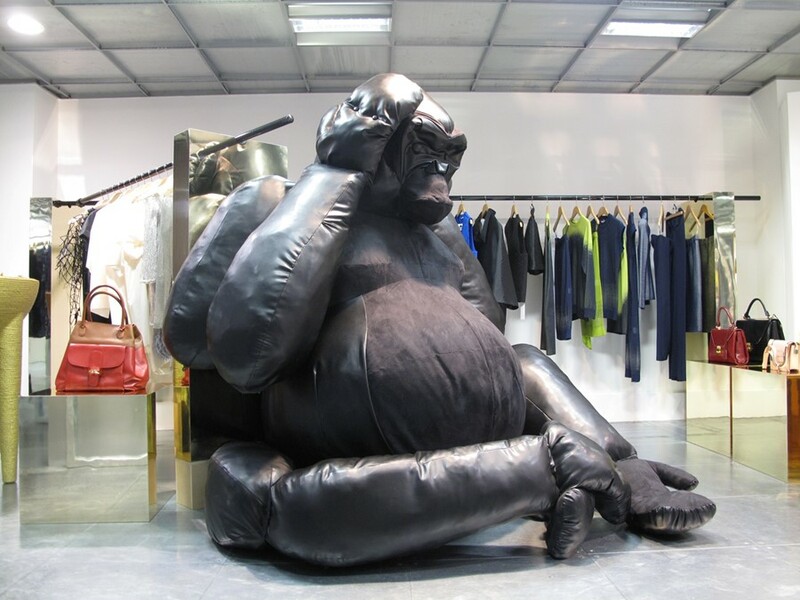 The new third floor received most traffic, as collections from some of the most cutting-edge designers today (many of whom were trained in London) including Phoebe English, Lucas Nascimento and Thomas Tait, congregate at Andy Hillman’s oversized gorilla. On the same level, Hedi Slimane launches London into Saint Laurent's new era with an in-store design concept consisting of a slick case crafted in art deco techniques conceived by its new creative director. The other big change can be found in what used to be a heady basement, now transformed into a contemporary, industrial space by British artist Graham Hudson. A giant speaker, also by Hillman, leads visitors down to a Fred Perry party of special t-shirts customised by British designers such as Giles Deacon, Simone Rocha and Christopher Raeburn – whose conceit was to remodel his into the brand’s signature stuffed hare. These sit alongside a travelling showcase of one-off designs by Neville Brody, SIBLING, Raf Simons and a bevy of other key designers, to be auctioned later on this year, with all proceeds going to the Amy Winehouse Foundation. In line with the reconfigured store, Dazed Digital asked the designers who were present what special objects fill their own living spaces and how their ideal homes might look. "A year ago I bought an Allen Jones painting – I’ve always loved his work. It’s not as graphic as a lot of his work, it’s quite hand-drawn and very beautiful. I also collect these German ceramics from 1940s to 1960s, which are white porcelain but matte. I’ve got loads of them in my flat, which is not my ideal living space – it’s spread over three storeys but far too crammed. My bed is up a spiral staircase up on the roof. I’m always finding these odd, awkward spaces to live, so maybe I’m just drawn to it." "My most special object is a miniature little head that I take with me on my travels for making hat prototypes. It was made for me by la Forme the blockmakers in Paris.. And my ideal living space ? BA first class at 35,000 ft above the Pacific!" "I’m such an object collector – there’s a sculpture by my aunt, which is a plastic stone that you can open and inside is another stone from a beach where we have a family house. A lot of amazing feathers that have been given to me by Mr. Pearl are very precious to me as well. I lived in an attic-apartment is Paris and it’s definitely a favourite place for me – I like being high up; at the moment I live in a basement room!" "I absolutely love my big, old and wooden desk, which originally was in my house as a dining table, then a work table and now it’s my desk. It’s really solid so it makes everywhere feel like home. I currently live in quite a small house with loads of stuff, so I dream of living in a big, clean space with nothing but one chair and a vase." "My bed is key. It’s the thing I associate most with comfort and I’m in it so much these days as I’m working really late. I also have this cheesy gas fireplace, with the remote control that I find really funny. Somewhere with an outdoor space while being very private and quiet is my ideal living space, and I would probably like to build it myself." "Photographs of my father when he was a young kid as a teddy boy and of my partner Justin and I going on various vacations, are very sentimental as I don’t get much time off. So it’s very nice to have this catalog of visuals to refer back to times that were really good. A thimble I’ve used since I was 16 is also very sentimental. To decorate my ideal space, I love the Labour and Wait aesthetic and its somewhat pre-war feel." "An exciting art piece by Nina Fowler and framed by my boyfriend has taken over my living room, it’s amazing. My ideal home would be a boxy house – built by me – with lots of glass and wood, and a massive bathroom." "The most special object in my home is a director’s chair that was used in one of the cult Mars Blackmon Nike commercials. Somewhere really quiet and zen would be my ideal living space – if you asked me five years ago, it would’ve been the complete opposite."